In the Irish folklore, a Leprechaun is a male fairy, usually presented in the form of a bearded man. This small person with magical powers can be heard prior to be seen and it is believed that you will be blessed with luck when manage to get one. Leprechaun will grant you 3 wishes to be released, or 3 times more coins when you get him on the reels of a recently launched video pokie game. 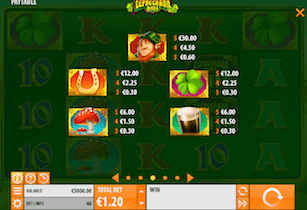 Advertised as the Quickspin´s 2nd most volatile slot in the history, Leprechaun Hills is a game designed to suit tastes of the most experienced high rollers. 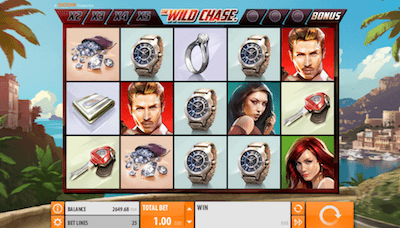 Nevertheless, nothing stops you from trying, since the game brings some massive winnings ready to be picked up. In the terms of visual appearance and sound effects, we talk about a game with stunning performance, that works just fine on any device, including the latest Android and iOS powered smartphones and tablets. Play With Up To $1,500 Free From Leo Vegas >>> Play Now! Leprechaun Hills is a classic 5-reel 4-row video pokie machine with 40 fixed paying lines, featuring the Lucky Respin Feature and Rainbow Free Spins that will help you minimize the absence of any progressive jackpot. Symbols are closely related to the main theme: the Leprechaun will bring you up to $2.000 for a combination of 5 these icons, while you can also score much of coins when get 3, 4 or 5 horseshoes, clovers or pints of beer. Playing cards designed in a familiar Irish style work as the lower-paying icons, as usual, and you can earn from $10 to $150 while betting at the maximum level. The Wild is a symbol with words “Leprechaun Hills” written on it an can make-up for any missing icon when forming a winning combination. Wild can appear only on the 2nd and 4th reel in a base game or during free spins and is able to replace them all but the scatter. Speaking of which, the icon with “Bonus” written on it is the game’s scatter and it is more than useful when it comes to the free spins round. 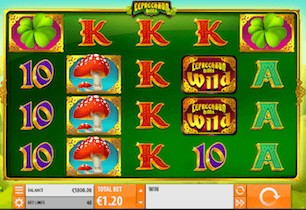 Lucky Respin Feature starts every time you win with a medium-value symbol (Leprechaun, Horseshoe, Four-Leaf Clover, Mushrooms or Stout) and turns the reels into the so-called Matrix system. What you’ll get are reels crowded with any of those symbols in massive stacks for a re-spin that follows. 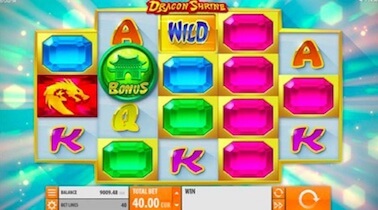 Collect 3 or more Bonus Scatters appearing only on the reels 2, 3 and 4 to start the Free Spins bonus round, where you will be awarded with 7 Rainbow Free Spins. Now watch the Rainbow mystery symbols turn into any of the game’s symbols and score as much as you can until the round comes to its end. There is a 50% chance that this randomly picked medium symbol will be just the one you need to get a combo. Leprechaun Hills comes with the theoretic return to player (RTP) percentage of 96.49% and the maximum single payout of $5.000 (or 1.000 coins) for a combination of 5 Leprechauns. High rollers now have another reason to celebrate, since Quickspin brought a game to put their skills and luck on a test – but on more than a rewarding one. 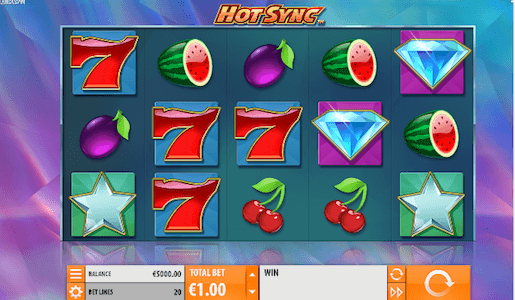 In addition to the non-progressive jackpot of 1.000 coins, you can largely benefit from features such as the Lucky Respin and Rainbow Free Spins. As long as you keep the reels spinning, you will continue to boost your bankroll, which actually was the main point when launching this game.